Welcome to the Synthetic Classic Portal! 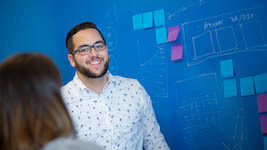 This page will help you get started quickly and efficiently with your application performance management. Here, you will find instructions on completing the registration process, logging in to the Portal, the Portal&apos;s basic features, and where you can find additional resources. When your user account is set up, you should receive an email with instructions on completing your registration. Click the link in the email to complete the registration process by setting your password and providing answers to challenge questions. You will need to answer these questions if you forget your password or need to reset it. If you did not receive this email, or the link in this email has expired, contact your Portal Administrator. When you log in to the Portal after completing the registration, you are asked to accept the site&apos;s Terms & Conditions. Select I&apos;ve read and agreed to the Terms and Conditions and click Next. The My profile page appears. Use this page to configure your login information and preferences, such as selecting the page that appears automatically when you log in to the Portal. For the browser versions supported for displaying the Portal, see Browser Support for the Synthetic Classic Portal. To select Chinese or Japanese as the default language for the Portal, click the language link below the login fields. 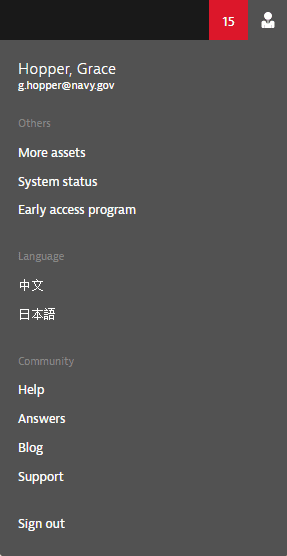 You can also select these language options from the user menu after you log in. The HTTPS secure protocol is used throughout the Portal. 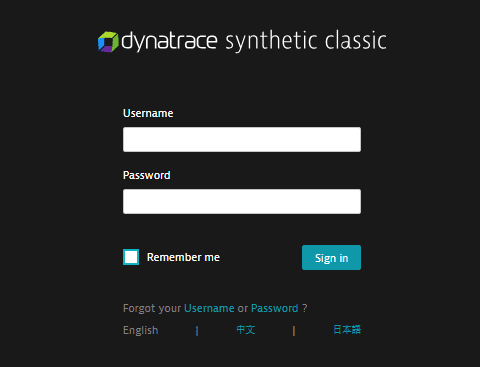 For information about security in the Portal and other Synthetic Classic components, see Dynatrace Synthetic Classic security. If you select Remember me when you log in, then when you close the browser without logging out of the Portal, you will still be logged in when you reopen the Portal and you won&apos;t need to provide your credentials again. The system remembers you for 30 days after you select this option. Select > Sign out in the Portal to log out and close the Portal. Use the Forgot username and Forgot password links under the login fields to request an automatic email to remind you of your username or to reset your password. For details, see Resolving Issues Logging in to the Portal. Portal features are available through the menus and icons at the top of every page. Analyze – The Operational summary page, interactive charts, reports, and diagnostic utilities. Business – The Synthetic Classic Portal&apos;s built-in dashboards. 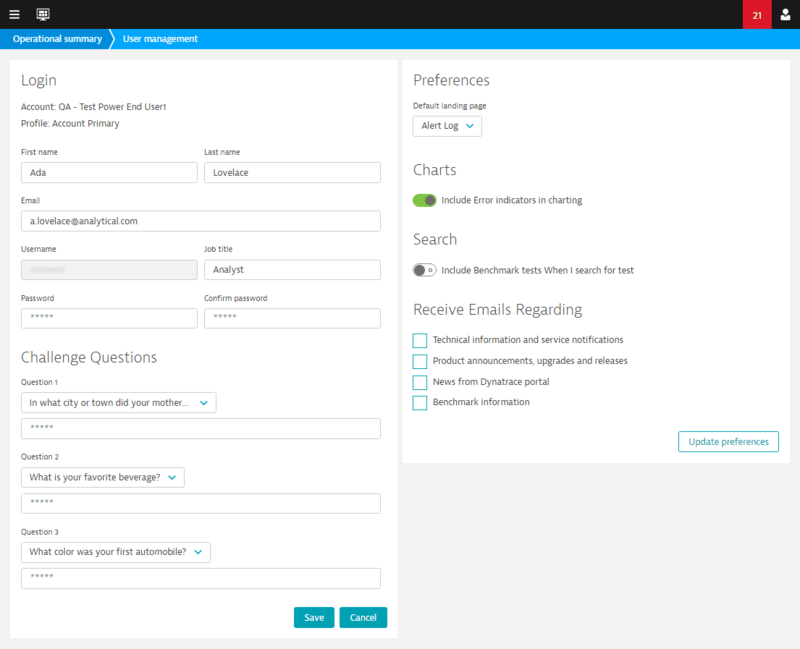 Manage – Tests, alerts, default configurations and templates, and measurement locations. 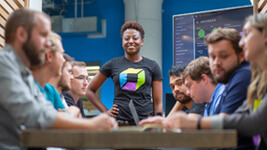 Administration – Account settings, user management, contributor groups, and event logs. For more information about accessing Portal features, see Portal Navigation. 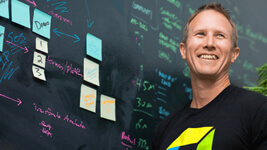 Create dashboards with custom tiles for your business, monitoring, and analysis needs. Create operations dashboards to monitor the health of your tests. The alerts icon displays the number of active alerts received within the last 24 hours. Click the icon to view the Alert logs page. If your account has had no active alerts within the last 24 hours, the icon is green . Your name – Click to display the My profile page. More assets – Display the Portal&apos;s downloads page to download the installer for the Windows Recorder or the Private Last Mile private peer. The downloads page is restricted to certain user profiles. 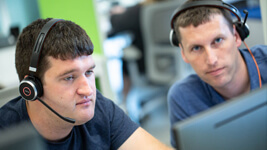 System status – Go to the Service and Node Status Notifications page in the Dynatrace Community. 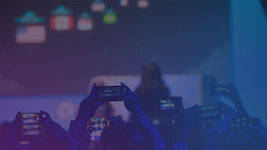 Early access program – Go to the EAP Portal to try out new features and enhancements. Language – Select the default language for text in the Synthetic Classic Portal. 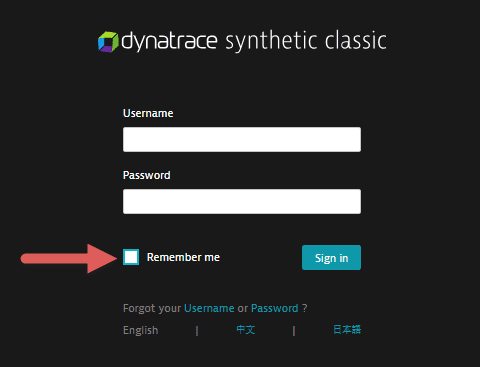 Help – Go to the Synthetic Classic documentation home page. Answers – Go to the Synthetic Classic forum. 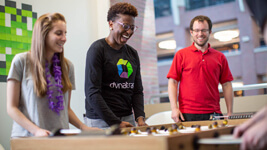 Blog – Read the Dynatrace blog. Support – Go to the Synthetic Classic Support page. Sign out – Log out of the Portal. To log out of the Portal, click > Sign out.